This script provides animation properties that allow you to easily design window animations using a declarative approach. Rather than writing how the animation should be performed, you simply write what you expect it to do, and this designer handles the animation for you! Opening animations are run whenever a window is opened, while closing animations are run whenever a window is closed. Here are some examples of custom menu window animations. To see them in action, copy them under this script, run your game, then open the party menu. Sample3 – windows slide in from the outside, performs fade-in and fade-out. These are the animations used for the preview picture. See the examples for a demonstration on how they are used. Note that the initial positions and other properties of the window may need to be changed in order to achieve the desired animation effects. For example, if you want a window to slide in from outside the screen, you need to first re-position the window outside of the screen before specifying the new x or y positions. Yes, luna engine is a completely different UI framework. This was based on the default engine. The problem was with the example itself. 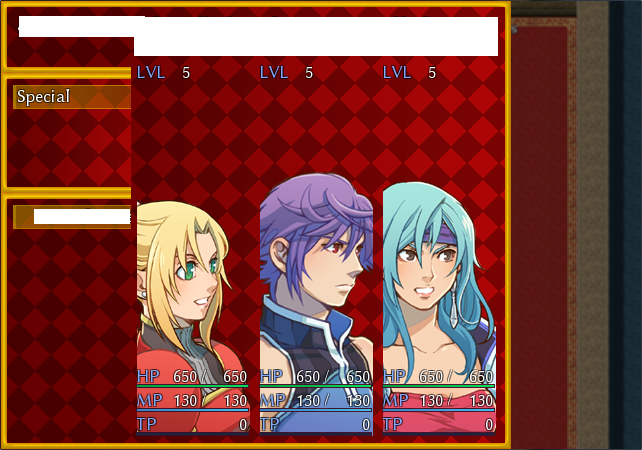 All of the menus use the same status menu, so it works for one scene, but not the other. I’ve put it in a simple modification to get it to work (by using separate windows for each scene). These are just examples; devs are meant to build their own animations and style each window to suit their needs. Well I managed to fix the problem after much trial and error using the sample scripts and they work fine now with the custom scripts. Thanks for your help! Sorry for late reply orz. I tried removing all scripts related to the menu but doing so didn’t fix the problem. Also I used your 3rd sample (editing only the numbers) and placed it directly under the script. Maybe that might’ve been the caused. Try it in a new project. I don’t think my script was already broken from the beginning. You need to remove all scripts one by one, not just the ones you think might be incompatible. Tried in a fresh, scriptless project and I still get the same results, even after trying out other samples and even without the samples (adding values after def opening_animation/def closing_animation). Send me the fresh project. It seems weird that you’re missing actors with a fresh sample. The script itself doesn&apos;t do anything. You would need to define animations for the new windows if you would like them to be animated. This script simply provides the framework that allows you to easily create animations. I’m using Yanfly’s shop script and there are definitely compatibility issues. Is there something I can do to make the currency window show up in the right spot or make it so that when I choose the equip command from the window is goes away when switching to show the party? What compatibility issues? Do the windows not show up correctly when you insert the script? You will most likely need to change where the window is positioned initially in order to have it appear in the expected place. I’m not sure how the shop windows work to comment on it.